Simple with a re-triggerable free spin bonus which lends itself to a potential for big wins. Microgaming has put together a Game of Thrones Slot and the question is not about whether or not winter is coming. (It is.) It’s is this thing worth a damn or will you want to be the next character that gets killed off so you can move on to better things. This thing is 5 reels, with just 3 rows and 15 fixed paylines. Keep in mind that you will find a 243-way version of this slot floating around as well. The design is pretty much what you’d expect to see when it comes to emulating the show. The Game of Thrones icon is the wild and is stacked in regular play and in feature play. The throne is gonna be your scatter symbol in this one. The free spin feature is re-triggerable. There is a gamble feature with this slot as well and it’s just a heads or tails type of a mini-game. You’ll basically just make your way through the provinces that are in the story. It’s different than the usual “double or nothing”, so that adds a bit extra flair to the game. 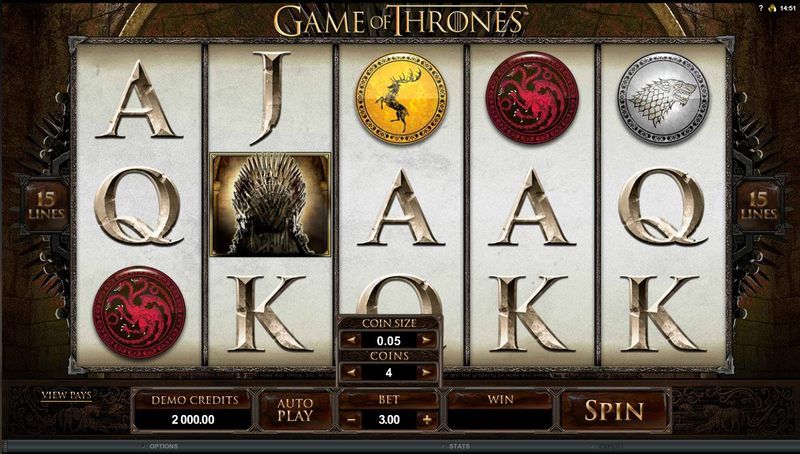 Simple and easy to play - that’s the main thing about the Game of Thrones slot from Microgaming. We like it that way. With the free spins bonus being re-triggerable, you could really run into some big wins. Just don’t go getting your head chopped off. Click here to see if winter really is coming.